140,000 people came to see some of the biggest musical acts, speakers, and events at Roskilde Festival 2016, not far from Copenhagen, Denmark. But many were dismayed to find posted signs at entrances stating the festival would be collecting and indefinitely storing all text and phone conversations, internet activity, and metadata while on the festival grounds. 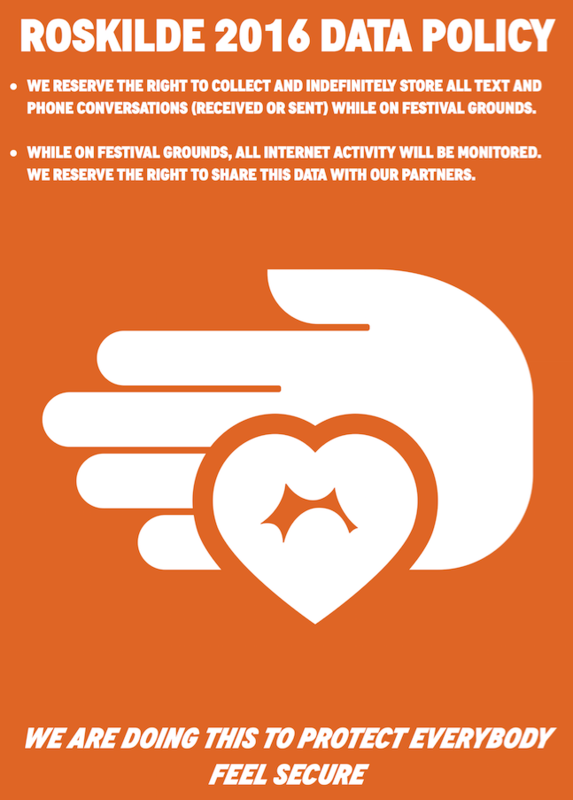 The signs, designed to look like the festival’s official branding, informed attendees that all digital communications would be collected and shared with “partners”. The day after all was revealed, the real Edward Snowden addressed a crowd of thousands live via video. It was the largest audience he’d ever spoken to. By pretending to use a few of the same surveillance tactics commonly employed by many governments, the action highlighted the frightening extent of the surveillance underway in Denmark as well as other European countries, and their collusion with the US National Security Agency. Read some coverage here, and more about the action and Roskilde Festival here.